abe.® CEM-blanc is a general purpose white Portland cement, specially manufactured to provide superior early strength with the added advantage of providing a wide range of aesthetic and decorative opportunities due to its key features of whiteness, high strength and durability. In addition to affording great design and colour versatility abe® CEM-blanc complies fully with the requirements specified in SANS 50197-1 for type CEM II 42.5N cement. By using the best available ‘technical grade’ limestone/clinker, abe® CEM-blanc is milled to a carefully controlled fineness to ensure high early and late age strength gain. Concrete and cement bound products made withabe® CEM-blanc is very easy to colour using normal pigments resulting in a wide colour spectrum with superior colour consistency. abe® CEM-blanc’s whiteness, consistent quality, versatility and strength make it the preferred choice for both readymix and precast producers. abe® CEM-blancas a CEM II 42.5N product can be further blended with fly ash, condensed silica fume, ground granulated blast furnace slag (GGBS) and limestone. Blending with other extender types/supplementary cementitious materials can slow early strength development and may influence whiteness. High performance ensures that the product’s cost-in-use or cost efficiency is far superior. This higher performance often leads to lower cement contents or higher replacement levels of less expensive input materials when using abe® CEMblanc. This results in improved cost versus performance against other less expensive/lower performance white cements. Contant quality control and monitoring guarantees high performance in the 42.5N strength class. The proportioning of constituent materials in a concrete mix (or cement bound formulations) is a complex matter which can be influenced by a number of factors. We recommend that laboratory and field trails be conducted (as appropriate) with available materials to ascertain optimum cement contents for specific classes of concrete and product formulations. abe® CEM-blanc is compatible with a wide range of admixtures that comply with the requirements of South African National Standard (SANS) 50934: Chemical admixtures for Concrete. These include (but are not restricted to) many different admixture types namely plasticisers, superplasticisers, air entrainers, thickening agents and accelerators. Admixtures in concrete should always be used in strict accordance with the manufacturers’ specifications and recommendations and it is advisable that trials are conducted to ensure that the admixture does not adversely affect the product colour. 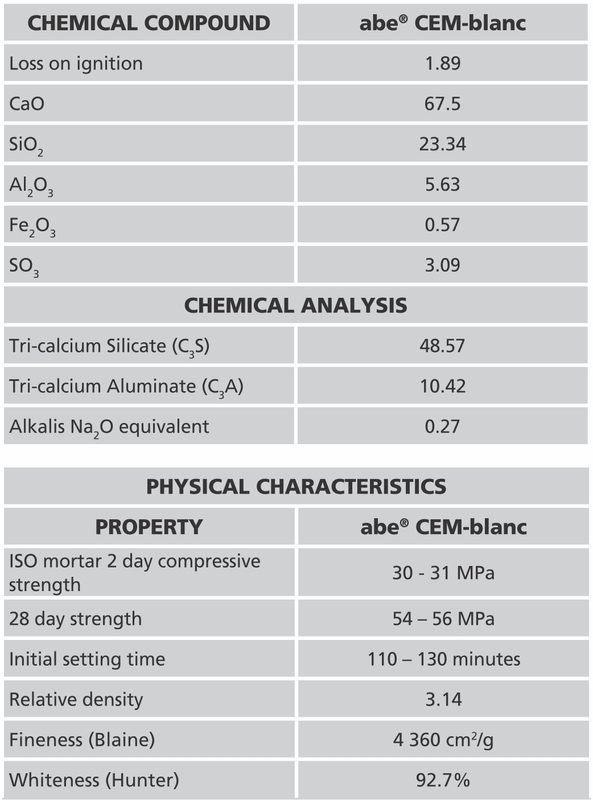 abe®CEM-blanc cement is available in 25 kg bags. It is suggested that cement products which have been stored in excess of six (6) months be re-tested prior to use. Portland cement products are highly alkaline materials and are directly affected by exposure to water. Suitable Personal Protective Equipment (PPE) and safety attire should be worn to prevent dust inhalation and direct skin contact. Full health, safety, storage and disposal information is available on the abe® CEM-blanc material safety data sheet (MSDS), a copy of which is available on request. 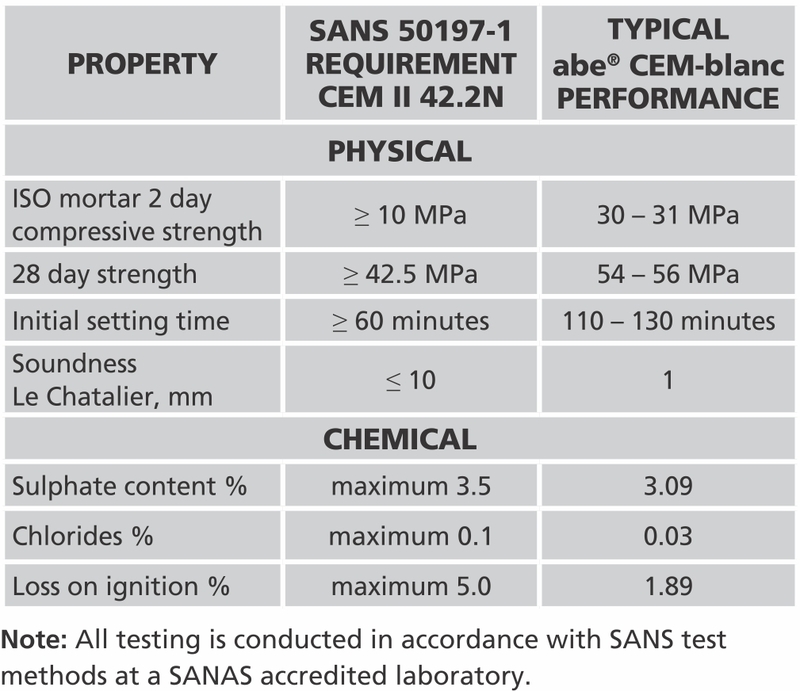 This data sheet is issued as a guide to the use of the product(s) concerned. 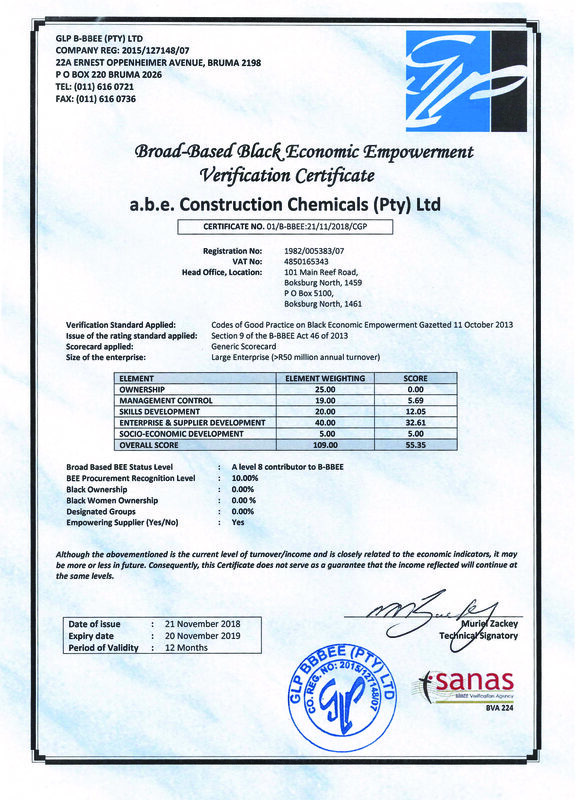 Whilst a.b.e.® Construction Chemicals endeavours to ensure that any advice, recommendation, specification or information is accurate and correct, the company cannot – because a.b.e.® Construction Chemicals has no direct or continuous control over where and how a.b.e.® Construction Chemicals’ products are applied – accept any liability either directly or indirectly arising from the use of a.b.e.® Construction Chemicals’ products, whether or not in accordance with any advice, specification, recommendation or information given by the company. Where other products are to be used in conjunction with this material, the relevant technical data sheets should be consulted to determine total requirements. a.b.e.® Construction Chemicals has a wealth of technical and practical experience built up over years in the company’s pursuit of excellence in building and construction technology.